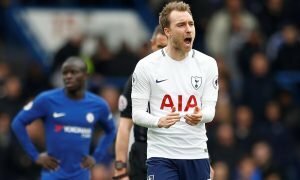 Spurs handed boost in race for lethal Chelsea target, striker will move this summer | The Transfer Tavern | Where football transfer rumours fly or die! With Spurs heading for the Champions League, the punters in the Transfer Tavern are hugely excited about the notion of a number of big money arrivals touching down at White Hart Lane. One of those being looked at is reportedly FC Basel forward Breel Embolo, as the North London outfit bid to draft in quality backup for star man Harry Kane. While the England star is likely to be one of the first names on the team-sheet, an increased schedule will surely require more firepower to arrive in North London. The 19-year old has emerged as one of the top strikers in the Swiss league, forcing his way into the national side ahead of Euro 2016. Having scored 21 times in 61 appearances for the club, German outfit RB Leipzig and Chelsea are also believed to retain an interest in the marksman. Now, Basel sporting George Heitz has revealed the talented teen is likely to depart the club this summer as clubs gear up for the proverbial silly season. ‘It’s very probable that he’ll leave this summer,’ he told Goal. ‘He’s played for three seasons in our first team and he’s just 19-year-old. At some point we have to accept that we cannot change our league. Should Spurs be targeting more established forwards to back Kane up?